Things are changing. 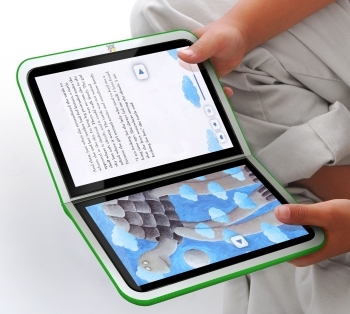 The second generation OLPC laptop will have dual touchscreens and will be designed to function like a book. What does this mean for early childhood education, special education, and augmentative and alternative communication? Over the course of this summer, we will be exploring this with the goal of being ready for these new technologies. Also, the goal is to be able to play a part in the universal design for learning of this powerful new initiative. For now, enjoy the pictures of this upcoming device. 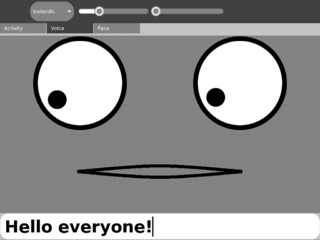 This opens up amazing possibilities for customized keyboards for all kinds of learners! Overall, this is probably the best news we could have heard. As many of us have been holding the OLPC touchscreen vigil, the time is here. Much thanks to Pixel Qi for pushing the hardware design to new levels. AAC stakeholders may be interested in their new motto: The future of portable computing is all about the screen. Additionally, many will be interested to note that Windows XP will be available on the XO. I originally read about the update to the OLPC at: Xcomony. This picture is inspirational when considering the accessible books project we are working on! Here is a portion of the presentation announcing the update. 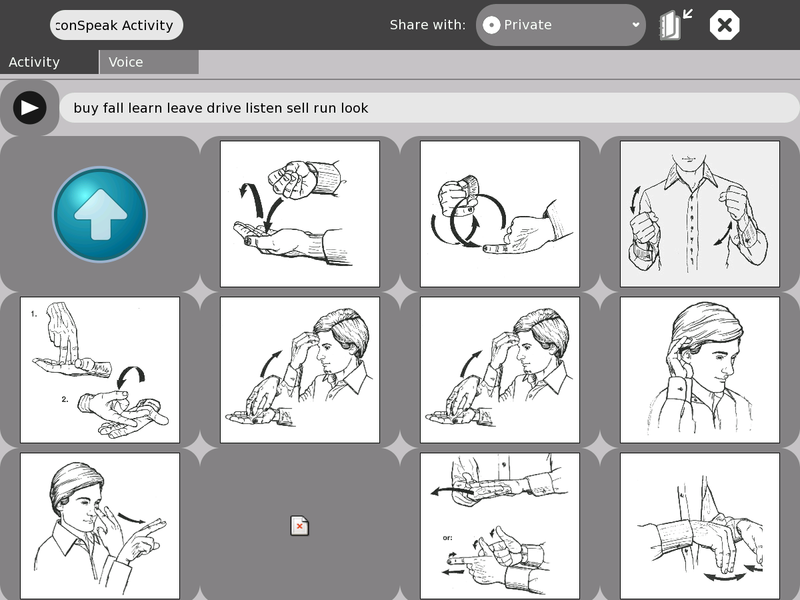 You can see that there are sign language based icons, mixed with English words. Most of the cells, or buttons, link to additional pages. Check out the “eat” page. You can move the cursor to the cell, click it, and the word that corresponds with the icon moves to the message window at the top. You can then activate the play icon for the message window to speak. So it is very clear to see that compared to the much refined commercial softwares, the initial prototype for IconSpeak still needs some work. Also, two switch step scanning needs to be considered for this software. Using tab or the arrow keys helps you navigate, but enter, the logical key command for entry does not work. There may be another key command I did not try that works, but nonetheless switch scanning would be a welcome addition to future builds. Features like switch scanning are representative of much more for this software to be fully valuable to a broad range of users. Whatever the drawbacks, this software shows what is possible. This software release clearly demonstrates the potential for an open source AAC software running in Python on OSX and Windows. 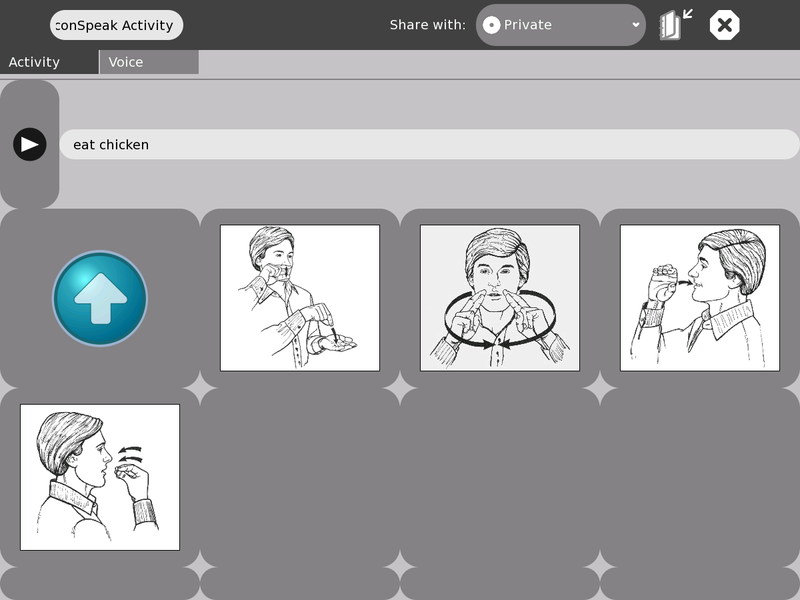 : ) The ability to quickly add your own images, ideally from the XO’s digital camera, would make it a potentially useful AAC tool very quickly. There is much more to be discussed about this software, but as they state on the wiki page that it will be updated rapidly, so we look forward to that and following the progress. So we watch, wait, and see if we can co-participate, knowing that the most important step is the successful release of a touch screen modification for the XO. It happened for the EEE PC. 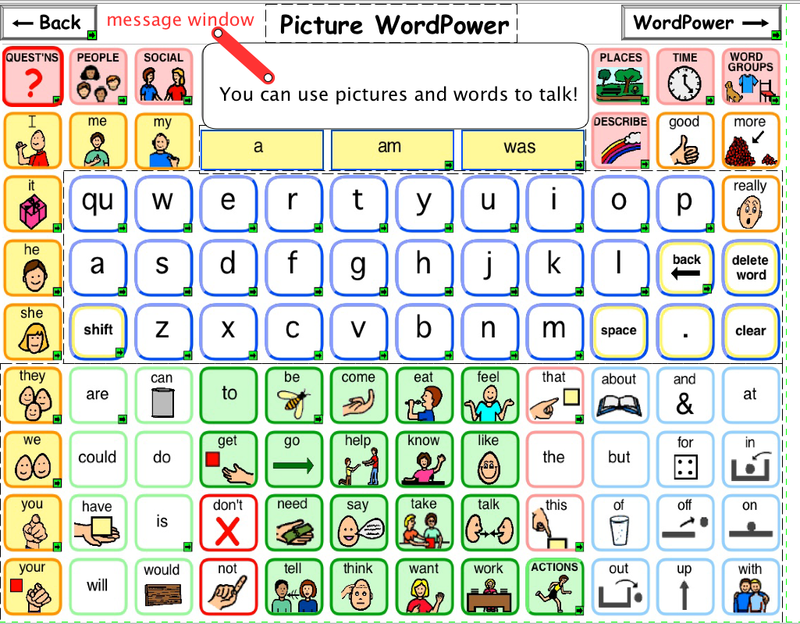 Individuals with autism or other developmental disabilities, may be able to use Speak, the open source software available for the OLPC XO laptop, as an augmentative communication tool to help meet their daily communication needs. The basic function of this application or activity as it is called in the OLPC world, is that you type, press enter, and it speaks. Look for a video podcast on this topic soon! As I am preparing for a flurry of XO based posts, I just have to get some of it out. The one to one concept is exciting me as a teacher more and more. It is important for us to learn the operational commands for the tools we use. Check out some of the commands for the OLPC XO computer. Go here for the full page, which includes the combination keystrokes. This page is maintained by the OLPC team. This page provides a listing of the agreed upon shortcuts for the system at large and for various controls within the activities, which should be referenced for consistency across them. For a high-level philosophical on the usage of various modifier keys, please refer to the HIG. Please see cheat codes for a list of boot options. the Delete key is the same as Fn-Erase. the Page Up key is the same as Fn-up-arrow (↑). the Page Down key is the same as Fn-down-arrow (↓). the Home key is the same as Fn-left-arrow (←). the End key is the same as Fn-right-arrow (→).